On September 11, 2001, four U.S. passenger planes hijacked by terrorists were used as missiles to kill almost 3,000 people. The first two planes crashed into the World Trade Centre’s twin towers in New York, the third into the Pentagon in Washington, and the fourth into a field in Pennsylvania. American Airlines Flight 11 departed Boston’s Logan Airport bound for Los Angeles at 07:59. Fifteen minutes later the plane was hijacked. It crashed into the north tower of the World Trade Centre, travelling at 440mph, at 08:47. All 92 on board, including two pilots and nine crew, were killed instantly. Another 1,462 died in the tower. The hijackers stabbed two of the crew, forced their way into the cockpit and seized control. One passenger had his throat slashed. The hijackers used mace and the threat of a bomb to force others towards the rear of the plane. At 08:24 air traffic controllers heard the following transmission from flight 11: “We have some planes. Just stay quiet and you’ll be OK.” The plane hit the north tower between the 93rd and 99th floors, destroying all three stairwells and any possibility of escape for anyone on the 92nd floor or above. The terrorist pilot of flight 11, Mohamed Atta, was the ring-leader of the suicide hijackers. American Airlines Flight 77 departed at 08:20 from Dulles Airport, Washington, bound for LA. About half-an-hour later the hijacking began. At 09:38, the plane crashed into the Pentagon travelling at 530 mph. All 64 on board, including six crew, were killed. On the ground, 125 military and civilian personnel died. Passenger Barbara Olson called her husband, US solicitor general Ted Olson, to tell him the plane had been hijacked. Her call was cut off but she rang again only to hear her husband inform her of the two earlier hijacks before she was finally cut off. United Airlines Flight 93 departed 08:42 from Newark, New Jersey, for San Francisco. The hijackers struck three-quarters of an hour later. The plane crashed at 10:02 into an empty field in Shanksville, Pennsylvania, killing all 44 on board, including seven crew. The flight took off 25 minutes late, and news of the other hijackings was already beginning to spread. The hijackers stormed the cockpit moments after a warning was sent to the pilot. According to a call from on board, passengers voted to storm the cockpit. Sounds of a sustained assault can be heard on the plane’s voice recorder. A passenger can be heard shouting: “In the cockpit. If we don’t we’ll die.” The hijackers were forced to ditch the plane early. It landed in an empty field, 20 minutes short of its Washington target. 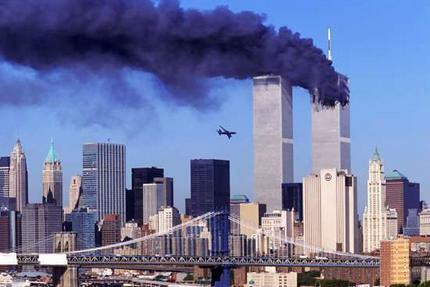 The terrorist group responsible for the September 11th attacks was Al-Qaeda (also known as Al-Qaida). It was established by Osama bin Ladin (also spelled Usama Bin Ladin or Osama bin Laden) from fanatics fighting in Afghanistan against the Soviet occupation from 1978 – 1989. Al-Qaeda helped finance, recruit, transport, and train Sunni Islamic extremists for the Afghan resistance. Al-Qaeda’s current goal is to establish a pan-Islamic Caliphate by working with allied Islamic extremist groups to overthrow regimes it deems “non-Islamic” and expelling Westerners and non-Muslims from Muslim countries. Al-Qaeda has issued statement under banner of “The World Islamic Front for Jihad against the Jews and Crusaders” in February 1998, saying it was the duty of all Muslims to kill U.S. citizens—civilian or military—and their allies anywhere in the world. The World Islamic Front for Jihad merged with Egyptian Islamic Jihad (Al-Jihad) in June 2001. Al-Qaeda directed the 12th October 2000 attack on the U.S.S. Cole in the port of Aden, Yemen, killing 17 U.S. Navy crewmembers, and injuring another 39. Al-Qaeda also admitted responsibility for the bombings in August 1998 of the U.S. Embassies in Nairobi, Kenya, and Dar es Salaam, Tanzania, that killed at least 301 individuals and injured more than 5,000 others. Al-Qaeda claims to have shot down U.S. helicopters and killed U.S. servicemen in Somalia in 1993 and to have conducted three bombings that targeted U.S. troops in Aden, Yemen, in December 1992. Al-Qaeda is linked to unrealised plans to assassinate Pope John Paul II during his visit to Manila in late 1994; a plan to kill President Clinton during a visit to the Philippines in early 1995; the planned mid-air bombing of a dozen U.S. trans-Pacific flights in 1995; and plans to set off a bomb at Los Angeles International Airport in 1999. They also plotted to carry out terrorist operations against tourists visiting Jordan for millennial celebrations in late 1999. (Jordanian authorities thwarted the planned attacks and put 28 suspects on trial.) In December, 2001, suspected al-Qaeda associate Richard Reid attempted to ignite a shoe bomb on a transatlantic flight from Paris to Miami.